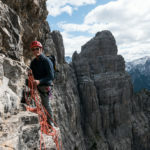 Climbing the normal route to the top of the Campanile di Val Montanaia is not just a good climbing route, it was an important achievement for the climbing history on one of the most spectacular rocky towers in the Dolomites , also known as the “petrified scream”. 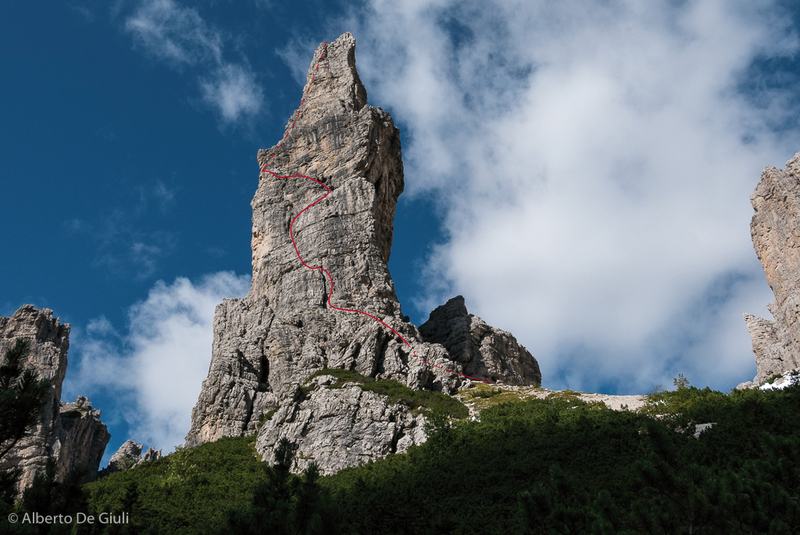 The Campanile di Val Montanaia is a 300m tall spire of the Dolomiti Friulane, it’s less than 2 hour drive from Cortina to get into the wild Cimoliana Valley and to reach the trailhead from the Rifugio Pordenone.It takes 1h30min at pretty good pace to cover the 800m vertical gain to get to the base of this tower. 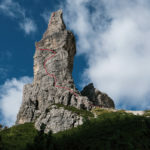 The Campanile di Val Montania was first climbed in 1902, the first attempt was done by two Italian alpinists and 10 days after two Austrian alpinists made it to the top. 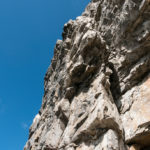 While climbing the normal route you will be impressed by the boldness shown by these first climbers in the two key pitches, the “Cozzi Crack” (five meters graded V/5.6 that require strength and technique) and the “Von Glanvell Chimney “(5-6 meters on a overhanging chimney, rated IV/5.5, starting from a narrow ledge 100 meters above the ground). 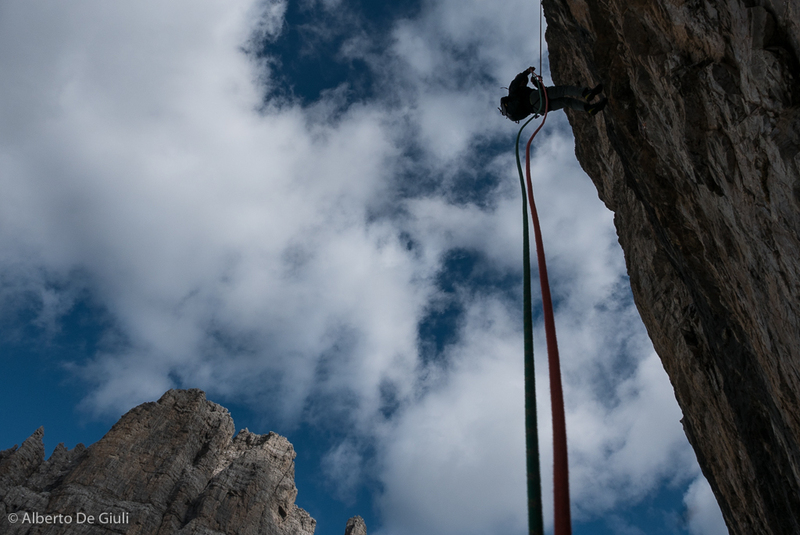 Climbing the normal route on the Campanile di Val Montanaia, 2nd pitch. 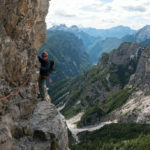 The normal route on the Campanile di Val Montanaia is quick to climb (9 pitches), I would rated the climbing around the grade IV/5.5 except the Cozzi Crack. 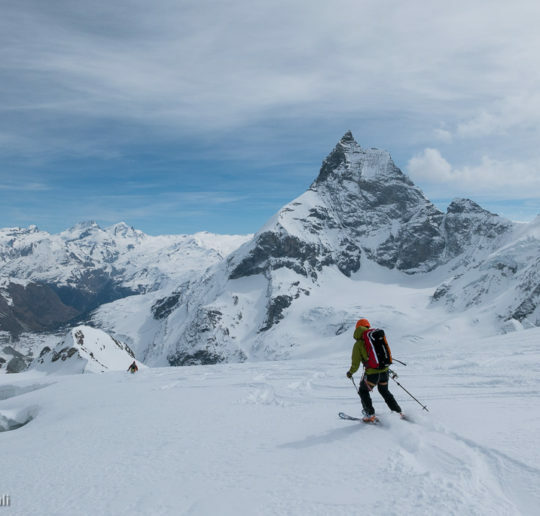 You can climb it normally from late spring late autumn, snow permitting (expecially for the approach), I would recomment to avoid the weekends as lots of teams might be around and they would ruin a perfect climbing day. From the summit, where little bell takes place of the classic cross, the way down it’s quick with a bunch of abseils. 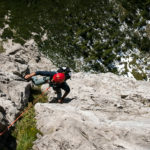 At the third anchor on the north face you abseil down the famous 37 meter rappel first done by Piaz, it was the longest rappel of the Alps in 1906. 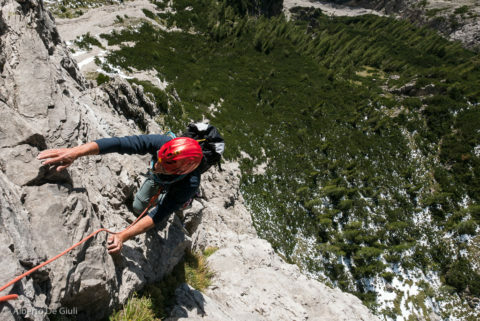 A jump into the climbing history not to be missed! 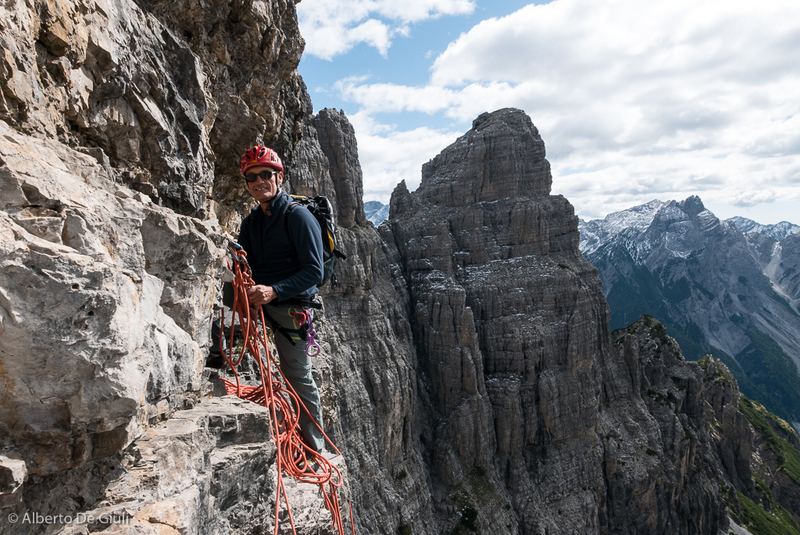 Contact me if you’d like to climb this Dolomites icon together. 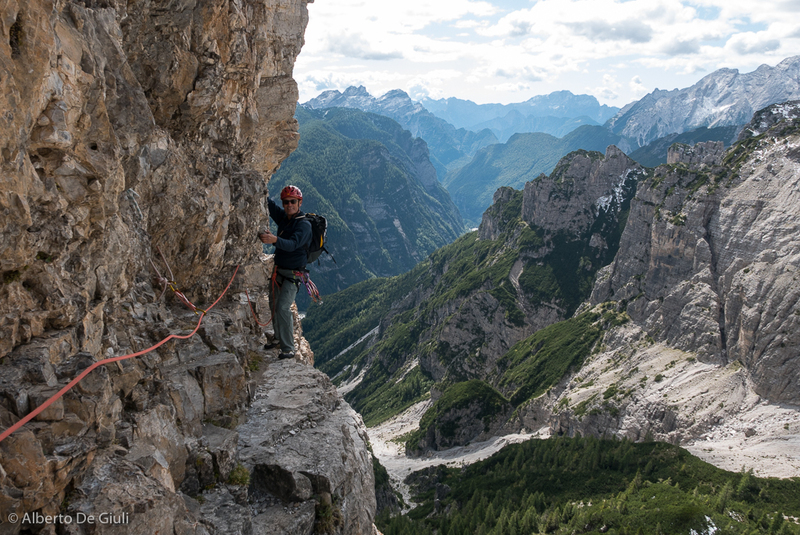 The normal route on the Campanile di Val Montanaia, Dolomites. 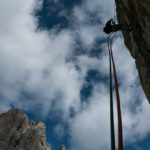 Climbing the normal route on the Campanile di Val Montanaia. 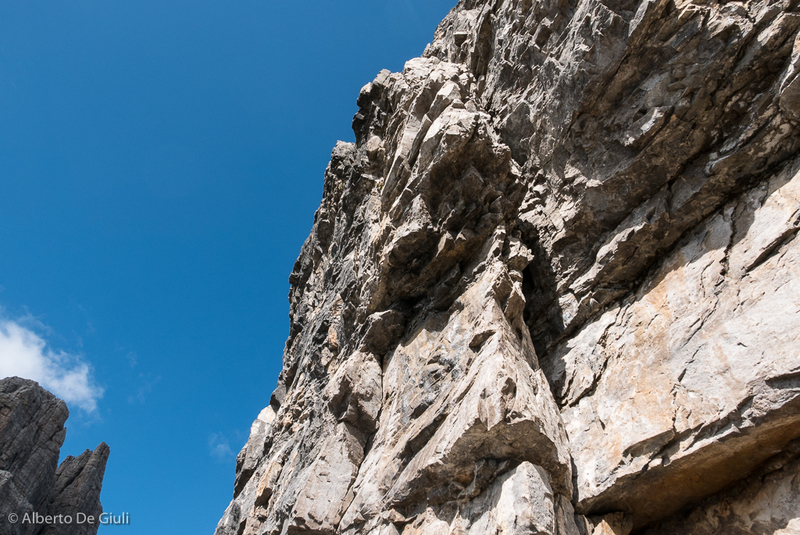 2nd pitch. 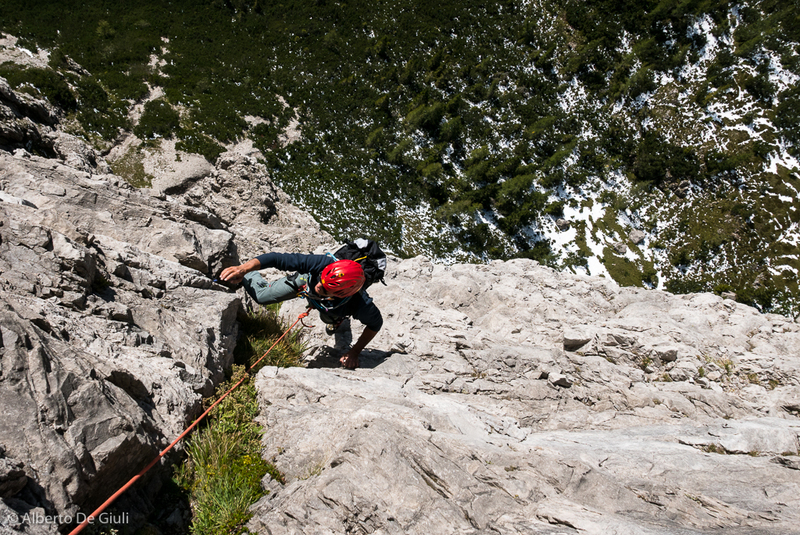 Climbing the normal route on the Campanile di Val Montanaia. The “Cozzi Crack”. 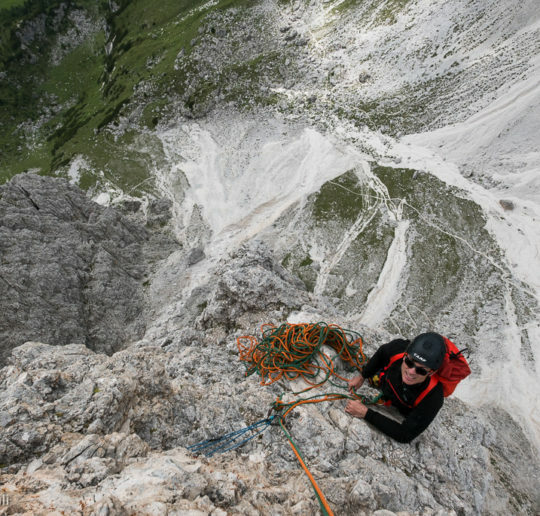 Climbing the normal route on the Campanile di Val Montanaia. 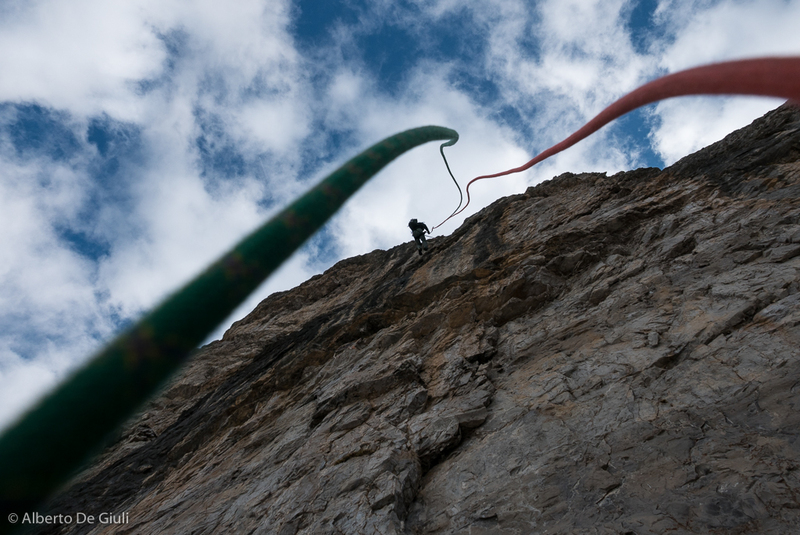 The belay stance after the “Cozzi Crack”. 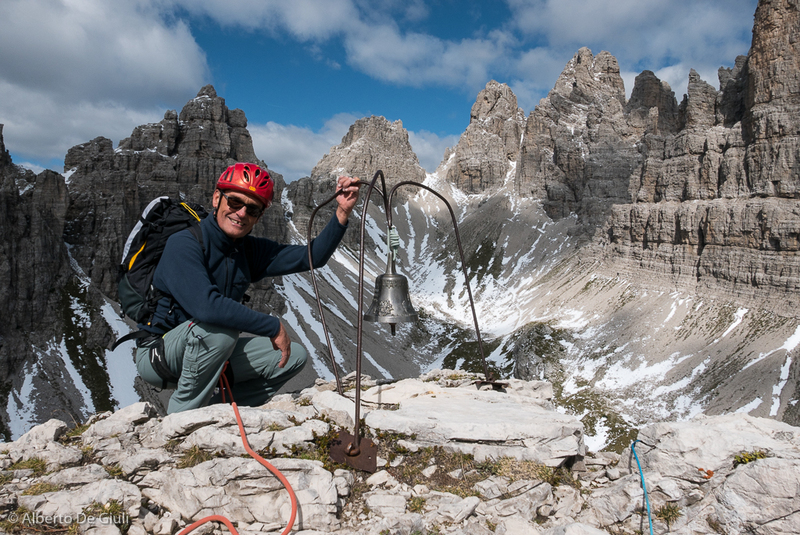 Tolling the bell on top of Campanile di Val Montanaia. 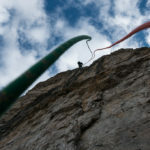 Rapping down the 37 meter abseil. 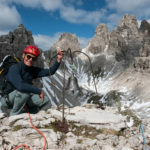 Campanile di Val Montanaia.